Are over-the-counter (OTC) drugs really worth stockpiling? As a family physician my answer is a resounding yes. Most of the following were actually prescription medications when first released. (In higher dosages, several still are.) Although other OTC drugs are worth considering, these ten have been selected due to their ready availability, affordability, safety in both adults and children, and multi-use potential. Used alone or in combination, they can effectively treat dozens of conditions including: headache, fever, sore throats, ear ache, menstrual cramps, heartburn, arthritis, ulcers, diarrhea, allergies, hives, congestion, dizziness, mild anxiety, nausea, vomiting, poison ivy, athlete’s foot, ringworm, eczema, insomnia, backache, gout, diaper rash, yeast infections, and many more common illnesses. 1. Ibuprofen (Motrin, Advil)– Among the OTC anti-inflammatory medications, ibuprofen is probably the most versatile. Primarily indicated for pain and inflammation, it may also be used to relieve headaches, earaches, sore throats, sinus pain, stiff neck, muscle strains, menstrual cramps, arthritis including gout, and back pain. It is also effective at reducing fever and is generally safe for use in children. It is not advisable for most stomach-related pain, although may decrease the pain of kidney stones, kidney infections, and possibly bladder infections. The most common side effect is stomach irritation or heartburn. When combined with acetaminophen it is nearly as effective as codeine, tramadol, or hydrocodone in relieving more severe pain. 2. Acetaminophen (Tylenol)– Acetaminophen is the only OTC pain-reliever that is not an anti-inflammatory drug. It will not irritate the stomach like ibuprofen, aspirin, or naproxen. It is useful for the same conditions as ibuprofen, though effectiveness varies according to patient. As mentioned above, it may be combined with ibuprofen in full doses for more severe pain. Side effects are very few, though in high dose, especially when combined with alcohol, it can lead to liver failure. It is available in several pediatric dosages, both for pain relief and fever reduction. 3. Diphenhydramine (Benadryl)– An inexpensive antihistamine, diphenhydramine is primarily used for drainage due to respiratory infections and nasal allergies, in both adults and children. It is also indicated for hives and itching, including itchy rashes such as poison ivy. Although not all patients become drowsy when using diphenhydramine, many do so, making this medication useful for insomnia as well. Some people find the drug relieves nausea or mild anxiety. 4. Loperamide (Imodium)– The most effective OTC medication for diarrhea is loperamide, which is available both as tablet form and liquid for children. It is often useful for relieving intestinal cramping. 5. Pseudoephedrine (Sudafed)– Pseudoephedrine is effective at relieving congestion of both the upper and lower respiratory tract due to most common causes including infection, allergy, chemical irritation, and mild asthma or bronchitis. It frequently has a stimulatory effect, similar to caffeine. The most common side effects are those resembling a burst of adrenaline: rapid heart rate, palpitations, and increased blood pressure. Years ago this drug was used in young children, even babies, though now most pediatricians do not advise it in patients younger than about six years old. 6. Meclizine (Bonine, Dramamine)– This antiemetic drug is available both over the counter and by prescription. It relieves nausea, vomiting, motion sickness, and vertigo-like dizziness. For some patients it causes drowsiness, and therefore may be used as a sleep aid. It is related to medications for anxiety and may help with this as well. 7. Ranitidine (Zantac)– Although several medications are available OTC for the treatment of heartburn, ulcers, and other acid-reducing conditions, ranitidine is among the best-tolerated, is inexpensive, and is also useful for relieving hives. Doctors often advise an acid-reducing medication such as ranitidine for patients who experience stomach upset when taking ibuprofen, though this must be done with caution. 8. Hydrocortisone cream– The 1% version of hydrocortisone is the strongest steroid cream available over the counter. It is safe for use in both adults and children in treating inflamed and/or itchy rashes such as eczema, poison ivy, diaper rash, and other minor genital irritations. 9. Bacitracin ointment– This ointment is best used to prevent skin infections when the integrity of the skin has been breached, as by an abrasion, laceration, insect bite, or sting. It also may be used to treat a superficial skin infection such as a mildly infected wound or impetigo. It is less likely to produce a topical skin allergy than other topical antibiotic preparations that contain neomycin. It cannot be used to treat deeper infections, however, which generally require an antibiotic by mouth. 10. Clotrimazole (Gyne-Lotrimin)The same antifungal medication, clotrimazole, is contained in both Lotrimin and Gyne-Lotrimin. Gyne-Lotrimin may be used to treat both female yeast infections and any other yeast or fungal infection that Lotrimin would treat, including athlete’s foot, jock itch, ringworm, diaper rashes, and skin fold irritations. For under $50 total a good supply of all of the above can be purchased. 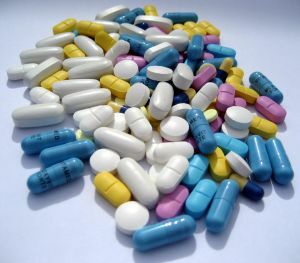 Several of these medications are also available at higher doses by prescription, and may actually be less expensive if obtained from a physician (ranitidine, meclizine, loperamide, and diphenhydramine), even paying full price. This entry was posted in 12 Steps and tagged First Aid, Medical, medications by paadmin.Bookmark the permalink. Staph is a skin infection caused by the bacteria that develops resistance to antibiotics and this situation arises due to excess use of antibiotics. So would just say avoid antibiotics as much as possible. Sudafed should be avoided by nursing mothers. It is so effective at drying you out that it can also dry up your milk supply. It can also work too well, causing excess dryness in the sinuses. Avoid the liquid versions of most of these medicines unless absolutely necessary as they all contain artificial colors, which have been linked to cancer and hyperactivity, high fructose corn syrup, GMOs and other synthetic chemicals with negative health effects. As far as liquid versions, this is good advice, as liquids are more likely to break down and are much more suseptible to heat. Liquids have a far shorter expiration time. Be aware that in many states Pseudoephedrine is tightly controlled and purchase is permitted only in limited quantities per person per month. Records of sales are also kept and monitored by the government. While stockpiling is a good idea, do so slowly and cautiously. If the law decides your purchases could be Meth related they will search your home. Your stockpile can be declared – in and of itself – PROOF that you are involved in the drug trade. No kidding! Try buying it on Oregon w/o a prescription and see just how far you get! Speaking from experience, the best batural way to get rif of a UTI/bladder infection is with cranberry capsules, odorless garlic capsules garlic cloves are better) and Kidney Activator. All can be purchased at a health food store with no intrusive govt tracking. You can get a lot of these OTC products at the Dollar store as well as other personal needs items. Don’t forget hand sanitizer, alcohol rub and peroxide. Make sure that all meds you buy are manufactured in the USA. Stay away from Dollar Store deals. They often carry meds manufactured overseas. That is absurd. There is nothing wrong with OTC meds purchased from a Dollar Store. Even those mfgr’d in foreign countries are just fine. They follow the same standards as the US. I have purchased prescription meds from overseas many times. As long as they are in sealed blister packs with expiration dates, they are just fine. Avoid China, Russian, & Asian sources that are unknown with no feedback, as some may be counterfeit. Sources in Canada, Europe, New Zealand, & Australia are just fine. I agree with that, Clyde. I’ve purchased otc drugs and vitamins from the $$ store many times and I’m still walking around. That is just propaganda from big pharma. analysts are saying that Ebola could be here in the USA by the end of the Sept., so please get ready JIC. there are 30 or more sample pages here that may help you learn more about viruses, read them even if you don’t want the $4 book. “Acetaminophen is the only OTC pain-reliever that is not an anti-inflammatory drug.” I’m confused by this statement. It was my understanding that acetaminophen is an anti-inflammatory drug, but non-steroidal (NSAID – Non-Steroidal Anti-Inflammatory Drug). Tylenol (acetaminophen) is considered an analgesic. Meaning it’s a pain reducer. Motrin, Naproxen and Advil are NSAIDS. They are different classes of drugs. With the way things are going in the world, I would suggest having plenty of this. Nuclear reactor melt downs. I am not a dooms day sayer, I am a realist, Goverments with different ideologies. Radioactive iodine can be a byproduct of splitting uranium atoms in a nuclear reactor. The radioactive iodine can damage or destroy the thyroid function of workers exposed to the element. They are often administered potassium iodide which occupies the thyroid lowering the absorption of the radioactive iodine which would damage the thyroid. Let’s not forget Asprin for its heart healthy benefits, also for the fact that Picric Aicid can be extracted. Very useful. Don’t forget a couple of thermometers! The old fashioned shake down one’s for adults that don’t require batteries. Also some disposable battery one’s for kids. What’s the best otc product for copd? Really need to know! The most effective I have found is mucinex (400mg Guifenisen), it keeps your coughs productive and airways open. My clients and family have been using it for more than 20 yrs versus all the inhalers with major side affects. Clotrimazole is a waste of time. At least three of the six known yeast infections are immune to it. Get borax. It is cheaper,stores longer, can be used to wash fungus out of your clothes (underwear, shoes), and has other uses besides. What is the true shelf life for these items though. Obviously rotating is ideal but if you stock and forget, I’d hate for something to happen and have all my meds be ineffective because they have sat too long. Each item has the shelf live printed on it, both opened and unopened. Most are good for 35 years unopened. One other thing we’ve included is Epsom salt. It’s great at soak and pulling out infection. Cheap as well.